Club Penguin Cheats by Mimo777 Club Penguin Cheats by Mimo777: Club Penguin Christmas Bad Robots From Elite Penguin Force!? Club Penguin Christmas Bad Robots From Elite Penguin Force!? A bunch of you have been telling me to take a look at the Robots Rockhopper has dropped around Club Penguin Island for the CHRISTMAS party. The first Robot is at the Dojo Courtyard. The Second on is at the Ski Village. The third one is at the Ski Hill. In these Missions you had to blow up these Robots because they stole some Puffles. So yeah, that's they story and we are sticking to it! Pretty cool when Club Penguin does stuff like that! But, why would Club Penguin put these robots in the Club Penguin Christmas party as toys if these Robots were bad?! Also, be Looking for the new mission soon! Have you tried the Mimo Blaster yet? Let me know if you cant' find it. I just thought it was some decorations. wow. thx mimo! Yeah, I noticed those! What's up with that?! I think they are just a toy decoration lol! maybe the robots seem nice but then they turn bad. Oh no... This can't be happening! Herbert has tricked rockhopper! I mean hertbert might just know what happened with the robots and how they almost distoryed club penguin (he would of saw the big robot I mean everyone saw it) so he met rockhopperand gave him these robot toys, but the robot toys will make a bigger robot and make that robot distory clubpenguin! we must act now! before it's to late! whoah...........WAIT!!! !they might take all the toys!!!!!!! They are at the ice rink! Wow, great idea! Wait... NOOOO! Yes, we MUST act now! Get on Club Penguin, server Summit, and meet me at the HQ to warn everyone! Jk, but STILL! Act now, everyone! I'm sorry, I'm just not a very patient person; When are you doing a Mod overhaul again? It should be soon, but I just wanted to check...Like I said, I am a very impatient person! Someone please, pretty please, respond! I think they are to do with the new mission coming soon!!! I think the robots being here are just an "easter egg". On a game, an easter egg is like something special or unique that is placed in a game mainly to see if the person playing it spots it. Like in some of the CP missions Rocketsnails logo appears several times. These robots are just a small reference to the EPF missions I think ;) although I could be wrong! I think it would have something to do with the next mission like you have to smash them? You know what's weird? There is a server called "Alaska", and also North Pole, and Northern Lights (Is there a such thing as Southern Lights...? ), and Tundra, and those are all located in the north. Penguins are only located in the Southern Hemisphere, like Antarctica...I would know I just did a little research. So, why have servers that are called Alaska or North Pole? And, by it's name, I am pretty sure the Northern Lights are only spotted in the north. And I would keep server Aurora's name, mainly because Aurora is a pretty name :) But, still, Aurora Borealis means Northern Lights, so...yeah tell me what you think! Maybe the robots came back to take over the puffles again or something. Same here I never noticed them lol. Hei Mimo I dont know if you know this but I found where the beta hat in wiglington and wenks is.Go to the mueseum and click the bee then you can choose the color of your hat! Well the ABC Blocks might not have nothing to do with this mission because why would herbet need A B C Blocks? I never noticed the robots. Wow, you r on it Mimo. I took a pic of my hamster in my stocking today. So qute! Oh, the time and room for my 700-day-old party is: Time is 3:00 CP time. Room is in my iggy. I will have it on the map. Reminder: Date is XMAS DAY! Oh, and this is my member penguin, not my penguin Syka. My member penguin is Bonky Beak, so look for that on the map. See you there! Weird. I check it out. Dont you find it weird, that every one of them is the wheel- bot? Maybe in the next 2 missions penguins without the DS game will be able to see the robots. Cool! This has like nothing to do with robots. When you go to the forest, and throw a snowball at the christmas tree, it becomes an ornament!!!! I think that quite cool and I think only happens in he forest. AWESUM! Waddle on Mimo and all other people! Also, some TVs in HQ are darker. Could that mean anything? Can't wait for new mission.Last mission is released Dec. 28 last year! I have seen a lot of doubles around ClubPenguin so thats know suprise to me. Sorry if i hurt your ears. Maybe it's about the new mission, or even the new agent helper!! Wow, 700 days old! (Mine is 728 2day!) I'll try to make it! Hope to c u there! Mimo, I know this dude and his penguin name is Kaose1028! He is a cool penguin!!! I dont know why but everyone is talking about him!!! There's also one with a santa hat on in the hq on top of the EPF cupboard! the new mission thing is really messed up!First,Herbert losts a oackage of seeds.Then,they show a sneak peek about the blank screen!And now-the robots! Oh my!!! i wondor it might even be for the new mission??? just a lucky guess! but yeah! cool!!! lets see what it turns out as! That is a little weird, but I think they're just doing the cold, winter theme. Yes, there is such thing as the southern lights. The scientific name is Aurora Australis. Great research, "sister"! Mine is 771 days old today! I guess I will have my 777th party on Jan 1st 2010! Just because of how busy everything is before then. So see you guys at my igloo, 2:00 PM Club penguin time! BTW i will have this date posted on my site! He probably wont do it until like May 2234. lol. That is mimo! WOW! I didnt realize it was released so long ago! Ummm Mimo...... I perssonaly think that they are there on purpose..... is it a sign for the new misson? Thats what I think Mimo, also look through the Binoculars at the Cove, the waves are getting rougher and if you wait for the guy on the Hydro Hopper thingy hes hanging on for dear life..... its differnt than normal. Did you see Aura Boreals on the island yet? Mimo, they're all the same robot, plus they have windup keys in them which only means one thing, THEY'RE EVIL TOYS! CALL THE PSA. EPF. ACP. ETC. THE NINJA ARMY. ANYTHING TO PREVENT THE TOYBOT INVASION!! I saw a nutcracker looking robot in the Cove! P.S Im Luis729 and that is my user name in CP! Well thx for the cheats!!! You rock! mimo guess what at the ninja hide out if you stand on the the fire emblem on the ground the fire stand thingy lights up check it out. I was just thinking. In the missions on normal CP there is one of these penguin robots in Gary the gadget guy's lab. Maybe this is the clue to the Eleventh mission in cp! This is prbbly how dot fits in as the new famous penguin! I know is saw that to! I didn't know how to tell you though. If you do I might be helpful. I don't know how to email you this but I HAVE BEEN USING YOUR MABYE 1 AND A HALF! Thanks for all the cheats. I would have nothing without your help. I don't care if you post this I just want you to know that my 8 clubpenguin friends and me say thx!!! Great thought!I am thinking that G(gary) is telling us get ready for a new mission! Ok first of all what sever is the party on? I just want to know. Second of all my penguin ( and I am a really old penguin) about 1200days old. I'm really old penguin and I have been playing on clubpenguin for more days then that. So yeah my penguin is so old but i have only been a since july! so yeah I just want to let all you non memebers know that being a memeber is not as great is you think it is. The D.S game now has Santa in it! You have to help Santa deliver presents! Lol! But What would Peas or wateva he dropped the last mission have to do with Robots? When did Robots eat Peas? Actually, its a very good theory but all the Australian servers are situated in the southern hemisphere. Herbert use robots to steal puffles! AHHH!! waddle for your lives!! Robots are destroying Clubpenguin!!!!!!! Hey mimo coins for change is still here? There's also fire extinguishers in the ski lodge, dock and ski village... weird isnt it? I thought they were decorations too! LOL I think they disguised them to look like presents to trick us! Like a lot of you have said ACT NOW! Maybe the robots grow to normal size try do destroy club penguin but they are just a distraction because Herbet is building robots or making evil plants! Yeah it looks like a trick using a wind-up wheel bot from mission 11 in EPF. What if the 4 robots (Counting the pro-bot) appear in mission 11 online will they team up with Herbet but then it's got nothing to do with the seeds we saw at da end of mission 10 on line i am quite confused. are you mimo thx? Noticed this from the start.May have something to do with the upcoming mission. Just ask CP company to let us know!! Yeah?!?! I was going to the third floor of the night club and wail the Santa's sled game was loading I noticed it said "Loading Maze" and I thought you mite want to know. Hey mimo i have lots of bad news. i noticed them aswell and they might be something to do with the mission. like gary programed them to be good and d helps so it could be secret agents, D and gary against herbert and klutzy. Rockhopper hasn't dropped them the sleigh has. Thats why Toys are all over the place. I thought that they might be part of the new mission! I think they're just toys for decorations but i may be wrong! Thanks for sharing with CPG! I asked Mimo on twitter and he replied saying "Good Question! Soon". Hope i helped! Hey Mimo, have u noticed that they are all the same? Cos in the game one of them has googles on. But then again their wind up toys! Oh also mimo there are gingerbread men in the center of the table! Command room. Oh mimo. Also maybe they are small enough to gain the puffles trust. Then they start a world war on club penguin. then in the next style catologue it has army clothes and guns so when u throw a snoball it shoots outta the gun! P.S. All of those puffle lives, wasted. Er not wierd. I am sorry. I hope you kill many a puffle! Hey mimo! The igloo contest is still there! Hey Mimo I love your blog and I just wanted to say something about the dojo. Its all snowflake like so do you think the ninjas on club penguin may become snow ninjas? The robots are probably for the mission! i think they are a toy but i have the elite penguin force game and those are the EXACT same ones! If you go into the Pizza Parlor,click on all of the food dishes on the long table. The pizza will keep reducing slices and the fruit cake gets icing put on it. Also you can change everyones plate by clicking on it. Oh, THANKS! I was being totally forgetful and I never pu the server! Sorry! OK the server is ICICLE. My backup server, in case that one is full is SASQUATCH. Remember, ICICLE=server, SASQUATCH=backup. Reminder: Room=my iggy. Look for Bonky Beak on the map. Time= 3:00pm CP time. Date= XMAS DAY! She wasn't modding. (Safa, I am positive u r a girl, but if you r a guy, sorry for putting she) If you're not modding, you don't put CPG mod. AW. Goodbye, Wii! We'll all miss ya here at CPG! Dude, don't put CPG mod unless ur modding. Again, dude, don't put CPG mod unless ur modding. Did you see the aqua grabber model in the right corner near the mine? Maybe it is only a Christmas decoration, maybe the robots have something to do with it... Even better, the mission could have something to do with it (just like the robots)!!!! DUDE! FOR THE THIRD TIME IN A ROW, DON'T PUT CPG MOD UNLESS UR MODDING!!!!! Do I have to say anything???? wow! you can notice many things other people can't noticed! that is kinda wierd...good thing you noticed that! you can catch things other peoople cant! nice eyesight! My internet went out yesterday again! Grrr. Anyway I'll start modding! That is definitely possible! I think water will come first, then snow! Just 4 more days Mimo! Just 4 more!!! maybe that new agent girl is part of herberts team!! :-0 that's terrible! Well just to say it's been a fun ride with you being a CPG MOD and we're going to miss you. Hey! Wait a second! Wasn't Mission 11 on CP gonna be about PUFFLES! Maybe those robots -that you said that have been stealing puffles- will be in new mission 11, doing something to puffles at Herbert's control! Sorry i forgot the server..... check my site by clicking my name and it will tell you because i forgot already. The server on Chobots Vanilla has dissapeared! Oh I got an idea! Remember how in the previous missions, Herbert the polar bear guy wanted to do something with the puffles? 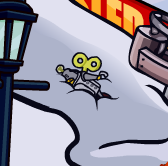 And apparently these robots have to do with kidnapping puffles in the Elite Penguin Force game? Well maybe Herbert's using these robots to take away the puffles. hey mimo!! i know its really wierd! anyways i think you should put up a contest of how many present are they in cp great idea huh? Umm...I appriciate your opinion, but I will never ever ever ever EVER kill a puffle...just saying! Where can i get the club penguin DS Game? ...Oh, wow! Awesome! I hope to c all of u there! Where do i get the club penguin DS Game? Hmm, yeah, you're probably right about the cold theme! I never knew there were southern lights! Great research to you too "sis"! What would a Polar Bear know about the alphabet. He probably needs a tutor. Try Gamestop, Wal-mart and Target. there not bad g fixed them because they had a fault in them and now the robots are fine. Z quitted, then you! Too bad u quitted from CP, too! Because of Christmas Party, they changed it! Cant wait for new mission! Q: Why dont PolarBears hunt penguins? A: Because Polarbears live on NorthPole and penguins live on NorthPole! Hello everybody! My b-day is on 22nd! (TOMORROW!) So waiting for your happy b-days by commenting or by Tweeting! ~~~~~~~~~~~~~~~~~~~~~~~~~~~~~~~~~~~Pretty sure its for the Christmas party! Yeah, me too! I was like: that one looks like the one in EPF! Nah, must be some decorations. Depends what country you're from cause they have different stores. Actually, last year they were decorated for Christmas also, but good job on noticing! Could be, but remember G built these robots, then they stole puffles. Wait a second... maybe Herbert fixed them so these robots steal puffles. And wait another second... maybe the seeds have something to do with this. Happy early b-day, speak to you on twitter tomorrow! I don't even know who Brittany Murphy is. I just heard to from my dad yesterday. I am 100% sure the robots have to do with the misson. Either that or it's just a toy for the christmas party. Mimo! hows it going? get this, if you go into the lodge, you'll find that one of the connect four games is flowting (its the one closest to the "gone fishing" door. hurry, don't miss it! p.s. it sometimes changes so walk through it or wait a while, so be a little patient. HAPPY BDAY ;) I bet you are getting so old that you need to go to a rest home. LOL! JK. Have a good b-day Safa! Ya noe wat i agree with Karate song i think the robots will make a big one and destory Club Penguin "...we must act now..."
HEY MIMO! CHECK IT OUT! IF YOU WAVE WHILE WEARING JUST THE CHRISTMAS TREE, YOU LIGHT UP !!! It all makes sense now the new mission is about the robots coming back to life and Dot from the EPF is going to be in it to help us this is so awesome!!!! If you go to the forest and click on the lanterns you can turn them on. I didnt know if mimo knew or not. Maybe there are knick knacks. Mimo, at the Iceberg what's with the Christmas Tree growing when people come? mimo, remember in the EFP game they stole puffles,and in one of missions on Club Penguin Herbert talked about stealing the puffles,think theirs a connection? There is an online mission for EPF agents...the puffle pranksters! "This server is full, please select another server"
Maybe Herbert and the toys will team up! well good mission Idea!But not sure about the Herbert Rockhopper thing! Just saying! But it would be very cool if rockhopper is included! Not only Robot's, theres those nut cracker people things too! theres one at cove and other place's too! Maybe it is the start of a new mission!!!!! Maybe people make the tree happy so it grows. And I do not think the robots are knick-knacks, but maybe! in the game the robots are good but get really bored. Herbert's gonna use them to get the puffles! lock your doors! Quick! The robots stole the puffles to IMPROVE themselves! Not because they are evil. THEY ARE ROBOTS NOT HUMANS! P.S. Sorry I haven't been modding and stuff, I have had a lot on my hands at the moment! I don't think it could happen but don't listen to me, everything I say has been proven wrong so just if you think it's right, it's right! Maybe your right, but I don't know lol! Ur right they do look kinda funny! Especially their little robot mouths! I thought it was some decorations as well. Maybe it is, or maybe not...I guess we were both wrong!